GM says anecdotal reports from showrooms suggests contractors and business owners who delayed purchases of pickups and other vehicles last year are buying now. 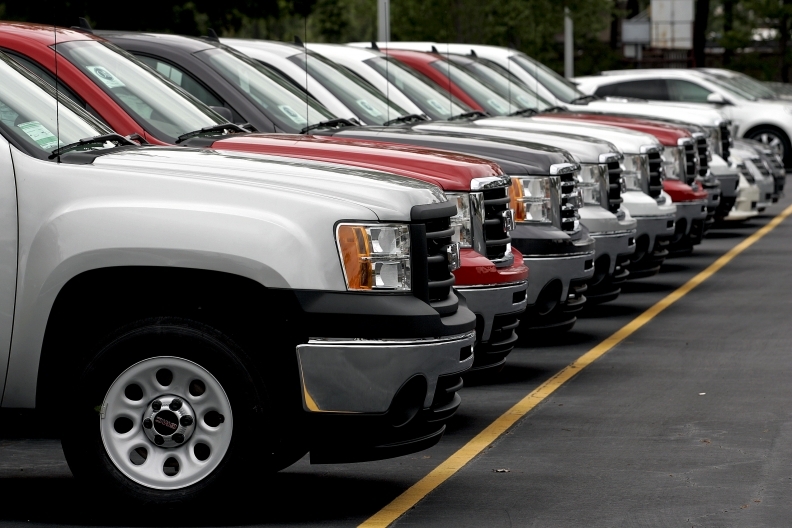 GMC Sierra sales jumped 9.6 percent last month, while Chevy Silverado demand rose 21 percent. Retail sales at General Motors Co.'s four core brands sprinted to a 39 percent gain in September, aided by strong pickup demand and comparisons with a weak year-earlier period that marked the first month after cash-for-clunker incentives. Overall sales, including those to fleets, at Chevrolet, Buick, Cadillac and GMC rose 22 percent for the month. Add in four discontinued brands that are running out of inventory, and GM's total sales rose a more moderate 11 percent. Demand for the Chevrolet Silverado pickup jumped 66 percent to 32,185 units, including a 64 percent gain in retail sales, said Alan Batey, Chevrolet sales chief. The GMC Sierra posted a 53 percent sales increase in September vs. the year-earlier period. The new heavy-duty versions of the pickups, launched in May, are key vehicles for GM, North American President Mark Reuss said yesterday on the sidelines of the Rainbow PUSH auto summit in Detroit. The heavy-duty pickups generally are more expensive than their light-duty counterparts and carry higher margins. In September, heavy-duties accounted for 22 percent of GM's large pickup sales. GM's average transaction price in September was $31,600 per vehicle, just slightly below an average $32,000 in the year-earlier period. Johnson said GM retail shoppers can expect better selection and availability of vehicles going forward. Because of production increases in recent months, GM's four core brands now have 478,000 vehicles in inventory, he said, a 22 percent gain over the 393,000 in inventory at the end of September 2009. Batey said output of the new Chevrolet Cruze is expected to reach full production at GM's Lordstown (Ohio) Assembly Plant in November. And Flint (Mich.) Assembly, where GM makes both light- and heavy-duty versions of the Silverado and Sierra, is operating on maximum overtime. Dana Rouse, shop chairman for UAW Local 598 which represents 1,800 hourly workers at Flint Assembly, said the overtime is needed to fill the pipeline of hot-selling, heavy-duty trucks.